Hey there, this was posted on March 10, 2015 by Jess W.
It’s hard to believe that Easter Season is already amongst us. I can already feel the hustle and bustle of the Easter baskets, picking out the perfect outfit, and the details of Easter dinner. As a Christian, it can be tough to balance tradition with the true meaning of the season is. Not that we choose not to remember, but we get so caught up in what’s going on in the world. Max Lucado’s “On Calvary’s Hill”- 40 Readings for the Easter Season is just what I needed to keep my mind in check for this Easter season. Nothing about Easter is about us, it’s all about Jesus and what He went through for us. This is not a season of remembrance to take lightly, instead it’s a season to embrace, remember, and reflect. Max Lucado walks the reader through 40 different readings. The readings start with a scripture, lead into a devotional, and end with a prayer. The reading the perfect length to keep your attention, but the content is gut wrenching (in a good way). If growing your relationship with Jesus Christ is important, then this is one book you need to add to your daily reading this Easter Season. Since I’ve been doing the devotional I’ve noticed three things. My love for Christ is growing because I’m spending extra time in the word each day. I’m hungry for more! What Christ did for me on that cross is glorious! I’m taking the death of Christ serious and getting a deeper understanding for what HE really did for me. 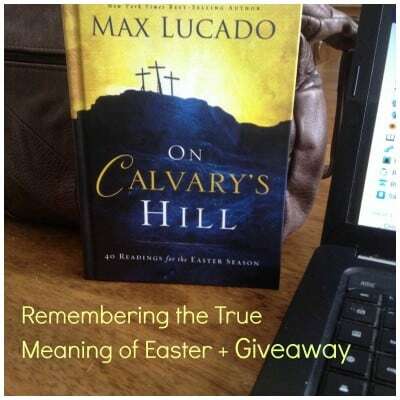 Grab your own copy of Max Lucado’s “On Calvary’s Hill”- 40 Readings for the Easter Season right here. We’re giving away a $10 certificate from Family Christian. Make sure you enter below. Tip Tuesday: Helping Little Ones Dye Easter Eggs Printable Easter Treat Bag Topper Review of The Advocate by Randy Singer + Book Giveaway Jeremy Fink and the Meaning of Life – the DVD! My favorite part of spring is the cool nights and warm days. I also love being able to open the windows and air out the house from all those winter germs! I love that all the animals like birds & squirrels are coming out! My favorite part of spring is seeing all of the beautiful flowers in bloom. My favorite part of spring is watching my boys get home from school and racing outside to play basketball, ride bikes, throw a football around, etc. They go out a little in the winter, but not nearly as much as they would like to and there is just so much joy in seeing them so excited to get out and enjoy the nice weather together! I love falling asleep to Spring showers! My favorite part about Spring is waking up and hearing the birds chirping! I love all things about Spring, weather, flowers, colors and again weather (long winter this year).